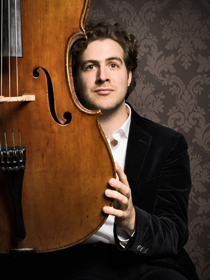 Julian Arp was born in Soltau, Germany in 1981, and received his first cello lessons at the age of six. He studied with Boris Pergamenschikow, David Geringas and Eberhard Feltz at the “Hanns Eisler” Academy of Music (Hochschule fuer Musik) in Berlin. He also attends master classes regularly, gaining important artistic insight from György Kurtàg, Ferenc Rados, Bernhard Greenhouse, Steven Isserlis, Lynn Harrell and Ralph Kirshbaum. Julian Arp has won a large number of prestigious awards, such as the first prize at the Felix Mendelssohn-Bartholdy Competition in 2006, the award for best chamber music ensemble at the Freunde junger Musiker, the first prize at the German Music Competition 2006, which included the special prize of the Deutsche Stiftung Musikleben, as well as the first prize at the 2006 International Competition for chamber music Premio Vittorio Gui in Florence. He recorded two CDs for the label GENUIN: the complete works for cello and piano by Felix Mendelssohn Bartholdy, and works by Chopin, Schumann, Janacek and Debussy. Julian Arp gave his solo debut at the Schwetzinger Festspiele in 1997, and has since performed extensively in Germany and all over Europe as a soloist and as a chamber musician. He has played with the Georgian Chamber Orchestra, the Berlin Sinfonics, the Radio Symphony Orchestra Berlin, the Shenzhen Philharmonic Orchestra, at the Schleswig-Holstein Music Festival, the Rheingau Music Festival, at the Festspiele Mecklenburg-Vorpommern, the Beethovenfest Bonn, Ludwigsburger Festspiele, in Beauvais and in Prussia Cove. Many radio-broadcasts were produced for the NDR, the SWF, the WDR and the RBB. Julian has been awarded many prestigious scholarships, such as the Boris Pergamenschikow scholarship that was awarded to him by the Kronberg Academy in 2004. From 1996 to 2001, he was the recipient of a scholarship from the Jürgen-Ponto Stiftung. From 2001 to 2007, he held a scholarship from the Evangelisches Studienwerk Villigst and was a fellow of the Villa Musica. Julian Arp is founder and artistic director of the Festival Zeitkunst for chamber music and contemporary literature in Berlin.